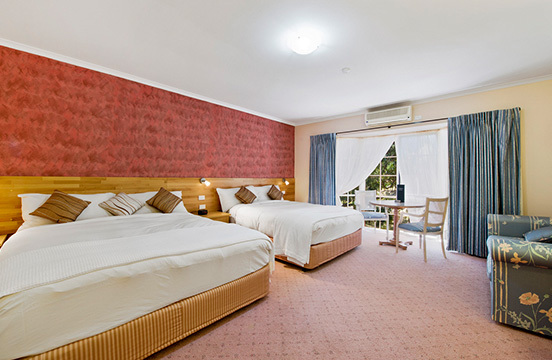 A spacious room with a King bed and a King Single bed bed (all in the one room). A spacious room with a King bed and a King Single bed bed (all in the one room). These rooms are fully non smoking, are on the second level (access by stairs only) and are located at the rear of the property. They all have electronic door locks, a wardrobe, spare pillows, a desk, a couple of chairs and have a private bathroom with shower facilities and a toilet. toilet. They also have tea and coffee making facilities, reverse-cycle air-conditioning, electric blankets, flat screen television, DVD player, in-room safe, iron and ironing board and a mini bar. If you are looking for peace and quiet with a pleasant outlook then this is the option to consider. We would love to hear from you! Please feel free to contact us. © 2018 Comfort Inn Country Plaza Halls Gap VIC.